It's just me..faith,grief,inappropriate laughter and my crazy life. : Deep waters call for deeper faith. 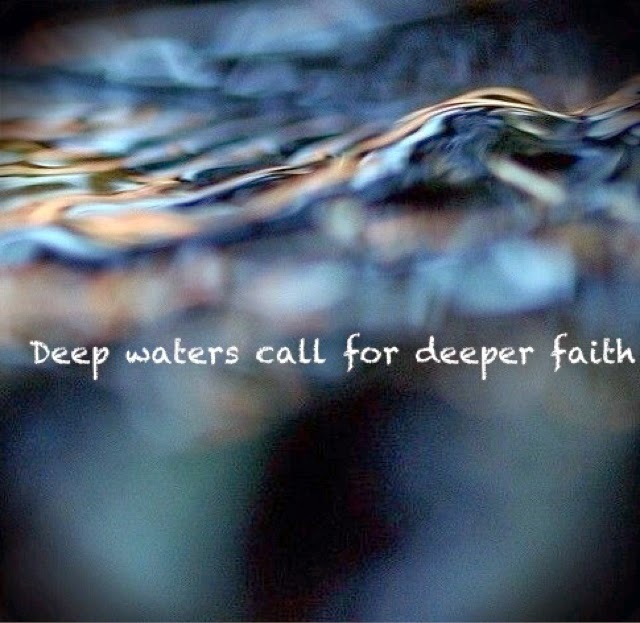 Deep waters call for deeper faith. Do you ever feel confused about Gods plan? Discouraged and yet always hopeful? Sigh....join my party. This morning I woke up in Kenya, my happy place and yet I cried. I breathed in the peace of this place all the while feeling turmoil in my heart. Who can calm the raging sea of my heart, Jesus. We all get disappointed, we all get undeserved grace. A fallen world is saved by grace, enough to cover every heartache. I have as much of God as I want...Sigh...then I want more, this is still not enough of Him. Im ravenous for more. Yes, life is hard somtimes and sometimes if we will look for it, life is great! It has its moments...somewhere between here and there we can see God. The curtain is pulled back and we see His presence, His angel armies, His comforting Holy Spirit. Who knows what will happen here in Kenya...I just know that I am an open vessel, leaky and broken, willing and desperate. He calms my heart and swims these deep waters with me, and when I can swim no more....He reaches down and rescues me.....next time I will be stronger, able to swim farther. Today I will see Him in all the lovely faces and places I go. Today I will be brave.